We've picked eight of the best holiday communities that Orlando has to offer. Not to be missed. Family Fun Town Home Resort. Lazy River, Tiki Bar and much more! Windsor Hills Resort, the closest resort to Disney with fun for all the family! On Disney's Door Step and with Fantastic amenities. A great family resort. World Class Golf Resort Minutes from Disney! Restaurants, Tennis and More! This section has the latest homes that we think are not to be missed and amazingly priced. Easy Choice Vacation Homes and Property Management Services offer the finest selection of vacation homes in Orlando, Florida and Disney Vacation Homes, conveniently situated in the Kissimmee, Davenport, Reunion Resort, Champions Gate, Disney and Orlando areas of Florida. We proudly offer luxury vacation rentals to suit all needs and taste. Vacation homes range from 1, 2, 3 and 4 bedroom luxury condos and town homes at Terrace Ridge, Windsor Hills, Windsor Palms, Cane Island, Reunion Resort, Heritage Crossing at Reunion, Regal Palms, Villas at Seven Dwarfs and Emerald Island Resort to brand new 3, 4, 5, 6, 7 and 8 bedroom Orlando Vacation Rentals with Private Pools, Spas and Games Rooms on first class Disney area resort communities including Windsor Palms, Windsor Hills, Champions Gate and Reunion. Easy Choice Orlando Vacation Homes strive to make your Orlando vacation easy and affordable, without compromising quality or service. All our Orlando Vacation pool homes, Condos and townhomes are in the Kissimmee, Davenport, Reunion Resort and Disney area of Orlando, Florida. All a short drive from Disney's Main Gate and the other fantastic attractions that Orlando, Florida has to offer. If your planning an Orlando family reunion, a golf vacation or simply looking for condo's or pool homes on the same community, or even next door, Easy Choice can help. Due to the number of Orlando condos we feature exclusively on Terrace Ridge and homes on the same communities, including luxury vacation resorts such as Reunion Resort, we are in a unique situation in that we can accommodate large group bookings by offering you a choice of multiple villas, townhouses or condos - many villas & townhouses being next door or very close to each other. Easy Choice Vacation Homes are proud to be an official Walt Disney World Vacation Home Network company. Our team understands the importance of communication and trust. We have a combined 60 years experience in Travel, Tourism and Property Management Services. As your dedicated vacation home Management Company in the Orlando, Davenport, Kissimmee, Reunion Resort, Clermont and the Disney area, we here for you, as your professional Orlando management services team. Easy Choice Property Management offer comprehensive vacation rental management and luxury vacation home management services and are meticulous in ensuring they are carried out to the highest possible standards. Easy Choice are a professional management company in Reunion and Davenport Florida and surrounding areas. Our objective is to help you turn your hard earned investment into a successful investment property that people will be delighted to stay in time and time again. Easy Choice Property Management services aim put your home on the map as a wonderful place to stay, and ultimately create more desire for people to stay there all year round. Easy Choice Property Management specialize in Property Management in Davenport, Florida, Kissimmee Property Management, Reunion Vacation Home Management, Property Management in the Champions Gate Area, Vacation Home Management in the Disney Area and Property Management in the Orlando area of Florida. Our Home Management and Vacation Rental Team currently have openings for homes in Reunion, Champions Gate, Davenport and Kissimmee. 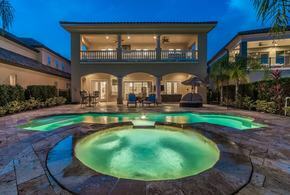 Read more about our Orlando Vacation Home management and our Orlando Vacation Rentals service.